I’ve been on a quest for the perfect headlamp pretty much forever. And I’m as close as I’ve ever been to headlamp happiness. 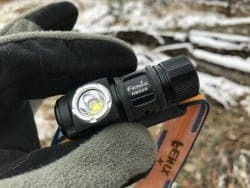 The Fenix HM50R Headlamp has almost all the features I want in a useful and highly productive form factor. Where the Fenix HM50R Headlamp really shines in the small details that refine its design and use. But to appreciate the nuances of the Fenix HM50R Headlamp, one would need to have developed frustrations with previous designs. So here are some obvious improvements with the Fenix HM50R Headlamp. First and foremost is the light throw. With a turbo mode of 500 lumens, this light screams in the dark. And the steps down in brightness of 130, 30, and 4 lumens are exceptionally good choices give all types of darkness the proper amount of light. 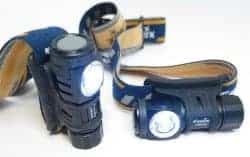 For comparison, my first headlamp was four D-cell monster with a dim incandescent bulb that probably threw two dozen lumens on a good day going downhill and with the wind. The pound of batteries were worn on the belt in a big red plastic case. A wire ran from the case to a bulbous unit mounted on a two-inch wide rubber strap. At the time it was like the light from a Maglite but with the advantage of a headlamp. Overall, it was awful, but since it was the only affordable option in town, we didn’t know any better. Today, however, our standards are much higher, our expectations much greater, and our tolerance for poor design much lower. In order to control headlamp lighting, a simple interface must power the light on and off and through the settings in an intuitive way that is watertight and works easily in the dark by feel as well as when wearing gloves. Another consideration is beam control. Headlamps by design are to be worn on the head. This means a significant amount of control is possible just by moving one’s head. 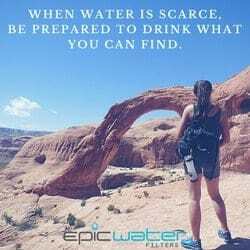 This works with gross movements, but what about when precision is needed such as with close-up work (think medical or mechanical interventions) or when moving through terrain with hands full and limited head movement? Generally a headlamp points forward or rotates down placing the center of light closer to the eyes. Lateral adjustments are from simply revolving head strap around the head. The Fenix HM50R Headlamp is essentially a cylinder in a cuff meaning it can spin 360 degrees around the vertical. The cuff is a rubberized plastic material that connects light to the headband. My Surefire Minimus headlamp uses the same attachment concept, but in a heavier, beefier design that requires a tool to adjust the tension. Normally I would prefer a Surefire light over almost any other brand, but the number of design flaws in with the Surefire kept me looking for a better light even after I dropped more than a Benjamin Franklin on it. 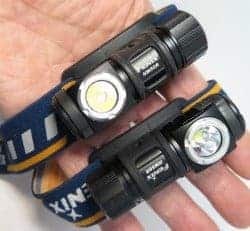 The Fenix HM50R Headlamp runs on a single CR123 battery which is my preference with headlamps, powers this light for two hours on full power and 128 hours on low with 14 hours and 48 hours respectively for the middle two settings. However, the Fenix HM50R Headlamp ships with a rechargeable 700mAh 16340 battery that extends the top end light by half an hour but lowers the runtime somewhat. The included battery recharges in the light through a micro-USB port, or outside the light in a charger. 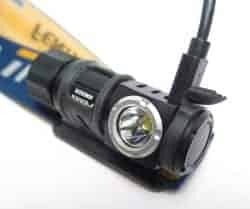 A similar Fenix light, the HL50 caught my attention with it’s ability to run either CR123 or AA batteries but required a extra tube extension if running AA batteries. That means one must carry the extra piece when running a CR123 battery in the light and nobody wants to do that. Well at least me anyway. Plus the HL50 headlamp had a metal attachment ring that was captured in between the battery tube and the end switch in order to keep the light attached to the metal clasp on the headband. That meant that you had to disassemble the light in order to remove it from the headband. 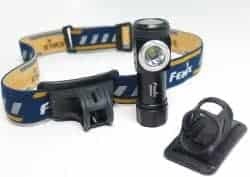 With the newer Fenix HM50R Headlamp, all you need to do to set it free from the headband is to pull it out from the rubberized collar. For reference, the Surefire Minimus also requires a tool to remove it from the headband because the entire attachment system must be dismantled. So why would you want to remove the headband from the light? Many reasons, notably that the Fenix HM50R Headlamp is a great flashlight on its own. The 90 degree angle-head design is like a mini military “moonbeam” D-cell flashlight. By the way, the first flashlight appeared around 1899 and was powered by D-batteries. So for almost 100 years, the D-cell ruled the flashlight world. Today I have no D-cell electronics except for a pair of 1950’s era Civil Defense Geiger Counters. As an angle-head flashlight, the Fenix HM50R Headlamp can stand upright, upside down, and sideways. Often tail standing a flashlight requires a reflective ceiling to capture the photons from escaping out into space. The Fenix HM50R Headlamp on the other hand can sit still on a table firing the light forward or upward if you like. On the Surefire side, even if you remove the light from the headband, only one end of the cylinder shape has a flat-enough face to tail stand. The Fenix HM50R Headlamp has a battery charge indicator in the form of a glowing or blinking green or blue light in the switch. When clicked quickly, the switch lights up indicating the rough amount of charge in the battery. This is a tremendously welcome feature for several reasons. First, it’s always good to know your battery’s condition. Second, as a rechargeable flashlight, the Fenix HM50R Headlamp can be topped off before adventuring so a quick charge indication will tell you both if you need to charge, and with charging experience, about how long that will take. And third, the subtle green or blue light does not interfere with the operation of the light whereas the Surefire Minimus begins an irritating blink sequence when its battery runs low. My lone complaint here is that the blue glow indicates a lower charge. Blue? Why not red? Red would make so much more sense, and Red is universal indicator of too much (redline) or too little (in the red). The meaning of blue must be memorized. And worse, if you use a Fenix rechargeable 16340 battery with built-in micro-USB port, the light on the battery glows red when low and charging, and blue when charged. So even within the Fenix family, a blue light means both fully charged and almost dead. May I suggest that the Fenix Flashlight engineers spend a few more minutes a week talking with the Fenix Battery engineers. It is those little things that are maddening. Regardless of the indicator light oversights, I highly recommend getting the ARB-L16-700mAh rechargeable batteries. The chief complaint about using CR123 batteries is their initial cost, and slightly less available presence in low-volume battery sellers like back road gas stations and small town grocery stores. So those same recharging superpowers that the Fenix HM50R Headlamp has are equally available in the ARB-L16-700mAh battery. Yes, the battery has its own port and can be charged just like a non-Apple cell phone. Something to think about with headlamp batteries is that you just might have to swap them out in the dark…with cold hands…in a hurry…while on the run. With the Fenix HM50R Headlamp all you have to do is spin off the only cap, swap batteries, spin the cap back on, and fire it up. This is so very different from one of my 3-AA headlamps where the entire light must be unsnapped from its headband bracket, then cracked open like an oyster, then replace each AA battery in the proper configuration, then reseal the housing in the right direction, reconnect it to the bracket in the right orientation. In other words, you need time, patience, and an understanding of the battery replacement sequence prior to the lights going out. Another great feature of the Fenix HM50R Headlamp is the minimal weight. 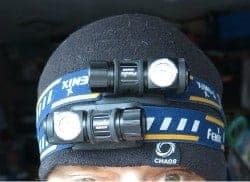 My other Fenix AA headlamps had some heft to them causing the light to bounce up and down on my forehead when running or biking, and being a noticeable weight on my head. So much so that a hard bump can knock the headlamp around if not wearing the strap that runs over the top of the head. With the Fenix HM50R Headlamp, no third strap is needed which makes donning it much easier especially when helmets and hats are involved. The durability of the Fenix HM50R Headlamp seems above and beyond. The aluminium chassis of the light conveys solidity to everyone. The fine threaded aluminium cap with O-ring seal is part of the IP68 rating of this light. IP68 decoded means IP for International Protection standard. 6 means complete protection from dust, dirt and sand for eight hours. And the 8 rating means water resistance at 1.5m for at least 30 minutes. Fenix seems to have upgraded its headband material. Compared to my other Fenix lights seems less snaggy (if that’s a word) with a tighter textile weave and with a grippy strip across the forehead. A few features missing from the Fenix HM50R Headlamp include that there is no strobe, no red light (to preserve night vision) and no SOS mode. You know, if it comes down to when I need to telegraph an SOS signal with my headlamp till the battery runs dry, well then I’ll regret the missing feature. But I will also likely forget that feature even exists if I ever have to use it. So as noted, I am thrilled with this particular Fenix HM50R Headlamp. While there is some obvious room for improvement, the room is small and probably only apparent to those who have used many other headlamps and developed specific preferences. Either way, I have no reservations about this headlamp for general use, emergency use, and survival use.